Once in a while I decide to share my recipes with you. When I say a while, I mean long long periods of time. In fact, along these almost-three-years of blogging, I only shared two. It was quite in the beginning and they were pretty simple and easy to do. I will refresh your memory: Pumpkin Cream Soup and Gazpacho -a typical Spanish cold soup. I am actually a daily cooker, you know? So I don't get to understand myself: why I don't talk about it more often? If I am honest, I would say that it's pure laziness of making cute photos while concentrating in the meal process. Laziness of explaining it in English too, because I am not used to. My understanding of cooking bases and taste combinations come from my mother, who is herself a really good cooker. Since my early childhood she introduced me into the kitchen activity. Very often she told me to sit there and look. Perhaps she just wanted to have company while doing her stuff. To be in the kitchen observing her movements and concentration made me attracted to this activity. In these moments I wanted to be like her, so into what she was doing. Eventually I started to cook too in her kitchen and now I do it in my own, evolving from her basis to my personal style. 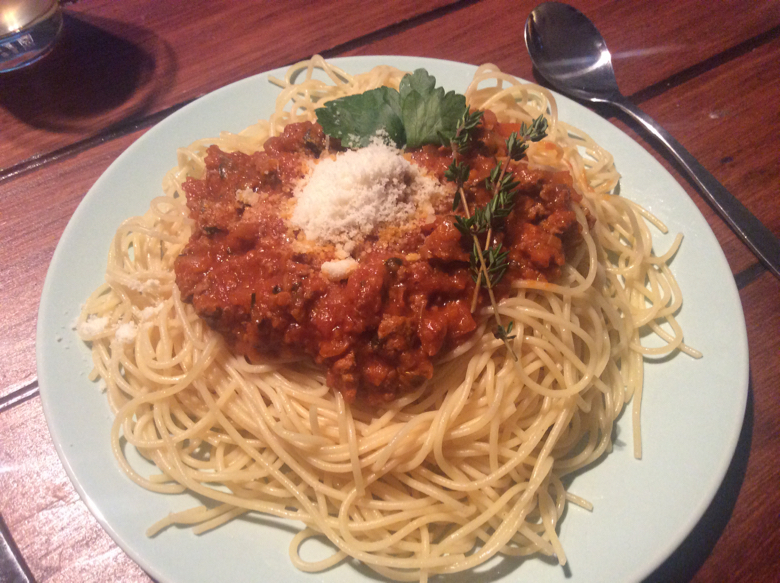 I will re-start this recipe sharing adventure with a meal that when my mother prepared it, there was never leftovers: "Ragù alla Bolognese" with spaghettis. 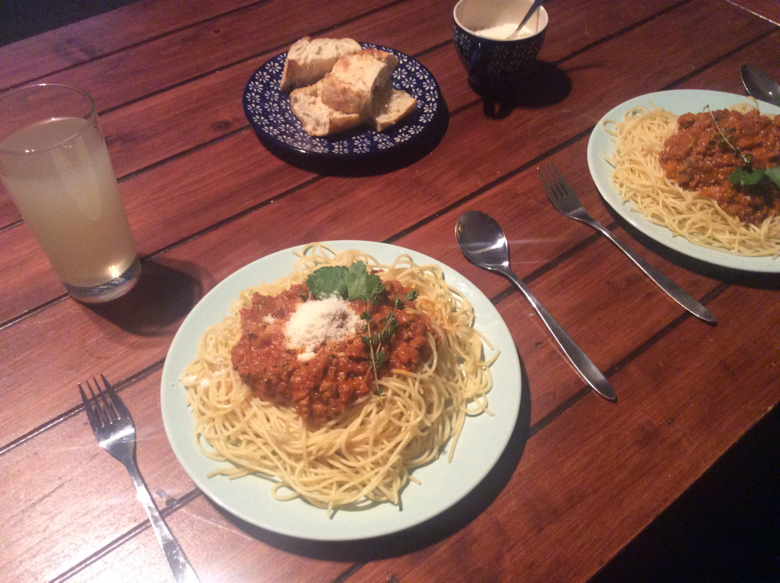 I am a nerd of gastronomy so I made my research to find out what is the very original recipe of this meal, the authentic Italian version. I found a great blog that explain it very well but I'm sad to say that is only written in Spanish. Despite I found the original recipe, I still made it on my own way. Actually, I made a fusion between my own and my mother's version. Well, here it goes the recipe. I won't explain how to cook the pasta because you just have to make it as the package indicates it. But I will note that after I strain the pasta, I add a bit of butter and I stir it. Like this, the pasta doesn't glue with each other and it gives a really nice taste. 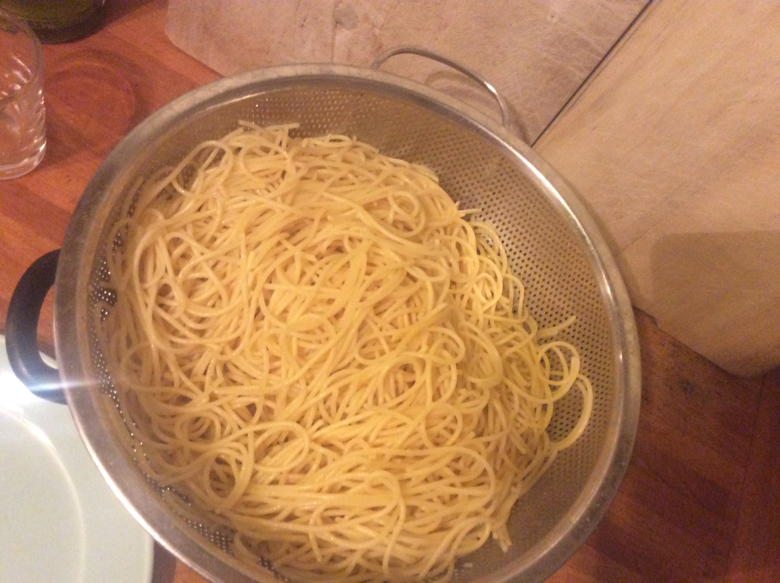 For the quantity of sauce I present here I would cook 500g of spaghettis. In a big pan on high temperature I put a bit of olive oil. When it gets really hot I add the mince meat, salt and pepper. I fry it strongly but for short time, to avoid that it gets dry. If the meat is good quality it's more difficult that this happens. 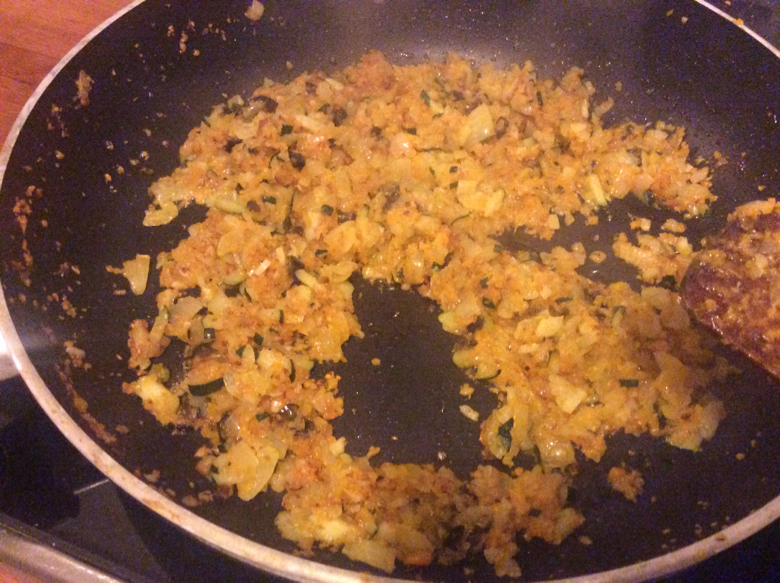 When the meet gets brown and a bit crunchy I remove it from the pan and keep it apart. In the same pan I put a bit more of olive oil and add the garlic gloves fine chopped. When the garlic starts to dance and becomes slightly golden, I add onions, carrots, courgette and olives; all very fine chopped. At this moment I lower the temperature, because I want the vegetables to cook slowly and to get really soft. While the vegetables cook, I add the cinnamon and the clove. I also add the white wine and wait for it to evaporate almost completely. 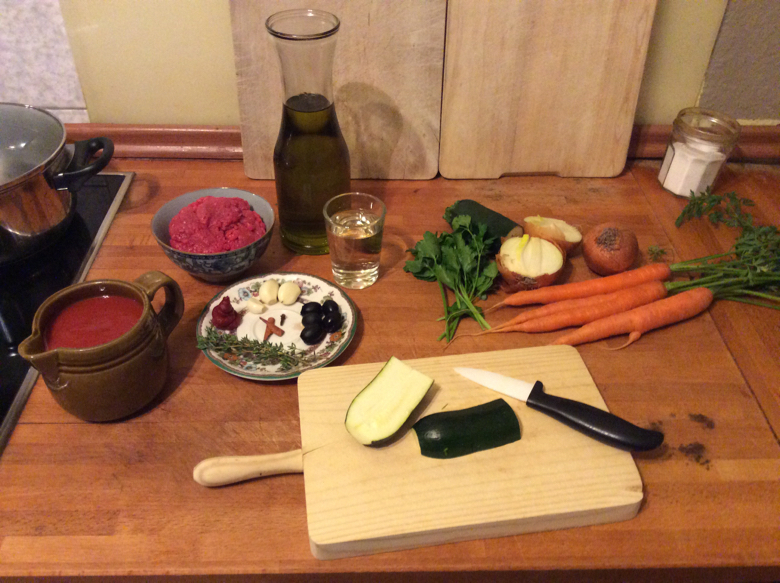 When I see that the vegetables have lost a lot of water and are reduced, I add the tomato paste and stir it. When the mix is homogeneous I add the tomato purée and continue stirring it. A little bit later, after the whole thing boiled for some time and the flavours have mixed, I finally add the meat and keep stirring time to time. At this point I remove the cinnamon stick and the clove (if I manage to find them). I let it cook in medium temperature until the meat is cooked but still tender. I add the parsley in the end because I like to feel it fresh. I barely chopped it because I like to bite it. The salt and the pepper is something that I add along the process and time to time I try the sauce to see If I need to add more or not. When the sauce is done, well, everybody knows what to do. Serve it over the pasta and top it with grated Parmesan -I actually use Grana Padano which is a bit less dry and I like it more.